Abbott and Costello William (Bud) Abbott and Lou Costello (born Louis Francis Cristillo) were an American comedy duo whose work in radio, film and television made them one of the most popular teams in the history of comedy. Thanks to the endurance of their most popular and influential routine, "Who's on First?" ---whose rapid-fire word play and comprehension confusion set the preponderant framework for most of their best-known routines---the team are also the only comedians known to have been inducted into the Baseball Hall of Fame. Bud Abbott was born in Asbury Park, NJ, October 2, 1897 and died April 24, 1974 in Woodland Hills, California. Lou Costello was born in Paterson, NJ, March 6, 1906 and died March 3, 1959 in East Los Angeles, California. After working as Allen's summer replacement, Abbott and Costello joined Edgar Bergen and Charlie McCarthy on The Chase and Sanborn Hour in 1941, while two of their films (Buck Privates and Hold That Ghost) were adapted for Lux Radio Theater. They launched their own weekly show October 8, 1942, sponsored by Camel cigarettes. The Abbott and Costello Show mixed comedy with musical interludes (usually, by singers such as Connie Haines, Marilyn Maxwell, the Delta Rhythm Boys, Skinnay Ennis, and the Les Baxter Singers). Regulars and semi-regulars on the show included Artie Auerbrook, Elvia Allman, Iris Adrian, Mel Blanc, Wally Brown, Sharon Douglas, Verna Felton, Sidney Fields, Frank Nelson, Martha Wentworth, and Benay Venuta. Ken Niles was the show's longtime announcer, doubling as an exasperated foil to Abbott & Costello's mishaps (and often fuming in character as Costello insulted his on-air wife routinely); he was succeeded by Michael Roy, with annoncing chores also handled over the years by Frank Bingman and Jim Doyle. The show went through several orchestras during its radio life, including those of Ennis, Charles Hoff, Matty Matlock, Jack Meaking, Will Osborne, Freddie Rich, Leith Stevens, and Peter van Steeden. The show's writers included Howard Harris, Hal Fimberg, Parke Levy, Don Prindle, Ed Cherokee, Len Stern, Martin Ragaway, Paul Conlan, and Ed Forman, as well as producer Martin Gosch. Sound effects were handled mostly by Floyd Caton. 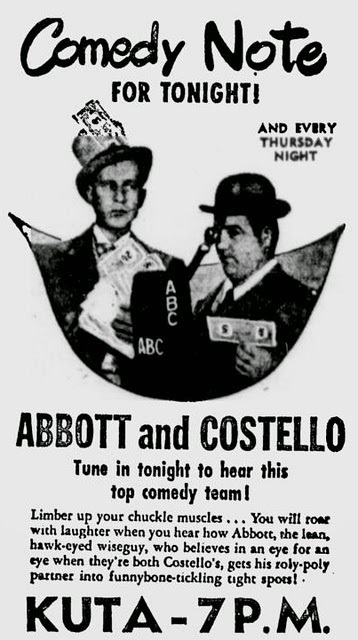 Abbott and Costello moved the show to ABC (the former NBC Blue Network) five years after they premiered on NBC. During their ABC period they also hosted a 30-minute children's radio program(The Abbott and Costello Children's Show), which aired Saturday mornings with vocalist Anna Mae Slaughter and announcer Johnny McGovern.